I realize that this is my second "Friday's Foto" Cooper's Hawk this year, but I couldn't pass over this magnificent adult raptor. Like the smaller, related Sharp-shinned Hawk, this large accipiter is a frequent visitor to bird feeders. 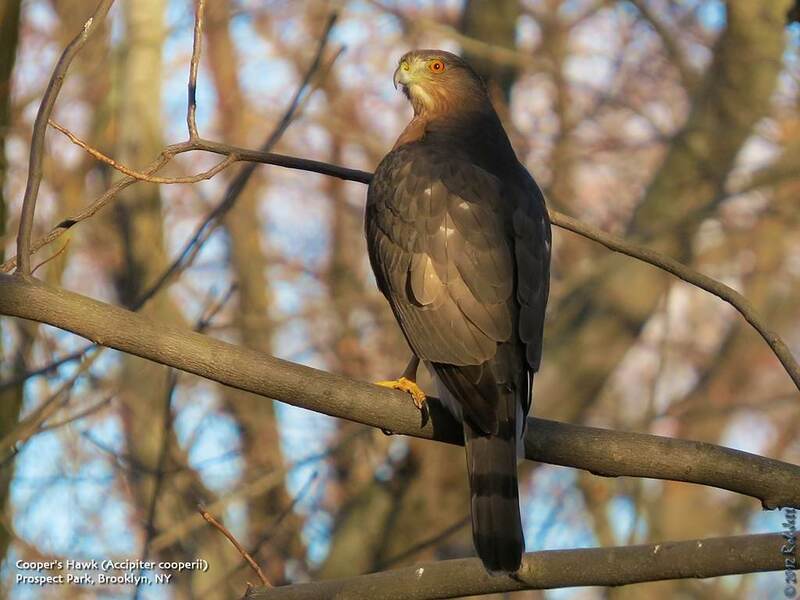 Named after American naturalist William Cooper, this woodland raptor is a common overwintering raptor around New York City. IBENO, Nigeria (Reuters) - An oil spill at an ExxonMobil facility offshore from the Niger Delta has spread at least 20 miles from its source, coating waters used by fishermen in a film of sludge. A Reuters reporter visiting several parts of Akwa Ibom state saw a rainbow-tinted oil slick stretching for 20 miles from a pipeline that Exxon had shut down because of a leak a week ago. Locals scooped it into jerry cans. Mark Ward, the managing director of ExxonMobil's local unit, said a clean up had been mobilized, and he apologized to affected communities for the spill. Exxon said last Sunday it had shut a pipeline off the coast of Akwa Ibom state after an oil leak whose cause was unknown. "This is the worst spill in this community since Exxon started its operations in the area," said Edet Asuquo, 40, a fisherman in the Mkpanak community, as women scooped oil into buckets. In some marshy areas, plants were poking out of the slick, not yet dead and blackened by the oil. "The fishermen cannot fish any longer and have no alternative means of survival," Asuquo said. The U.S. major's outage comes on top of multiple production problems in Africa's biggest crude exporter, after fellow oil majors Shell and Eni reported disruptions at onshore sites due to oil theft and Nigeria's worst flooding in 50 years. "Mobil Producing Nigeria (MPN) regrets this incident. Our teams are being mobilized to clean up the area," Ward said in a statement emailed to Reuters. "We apologize for the inconveniences that it has caused." One fisherman described noticing a large quantity of oil on the surface of the sea and all over the beach the Friday before last, adding that the company has since sprayed chemicals in the water, which was helping to disperse it. It was the second major oil spill near Exxon facilities in three months. At the end of August, an oil spill left a slick running for miles along the coast. Oil spills are common in Nigeria, where enforcement of environmental regulations is lax and armed gangs frequently damage pipelines to steal crude. Oil majors say thieves are responsible for most of the spills on shore. A U.N. report in August last year criticized the government and multinational oil firms for 50 years of oil pollution that has devastated the Ogoniland region. "Our prayers are for tough punishment on the oil companies operating the Niger Delta," said Inyang Ekong, the secretary of the fishermen's association, as the car he was in swept past oil washing up onto beaches in an area called Ibeno. Oil major BP Plc this week agreed to pay $4.5 billion in penalties for spilling nearly 5 million barrels of oil into the Gulf of Mexico. Despite thousands of barrels a year spilt by oil majors in Nigeria, none has ever been forced to make a financially significant settlement. Some communities are now attempting to sue for compensation from Shell in Western courts. A raft of production outages has caused export delays to Nigerian crude to lengthen, as the country's number one export suffers acutely, oil traders say. Shell still has a force majeure in place on Forcados and Bonny Light crude oil grades after a tanker being used to steal oil caught fire on September 30, spreading a blaze across several oil and gas installations. 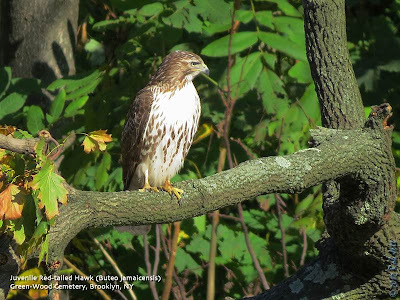 Sunday, December 2, 2012, 8 a.m.
Meet the amazing birds of Prospect Park on this expert-guided walk. Weeds and garden herbs look different in winter mode. Join herbalist Gert Coleman to identify plants by their seed pods, bark, and other characteristics. Meet in the parking lot at the end of Hylan Blvd. For more information call Gert Coleman at 718-356-9235. Saturday, December 1, 12 noon to 2:00 p.m.
Past and present blend in the Conference House Park where history stretches back thousands of years with the seasonal occupation of the Lenape people and hundreds of years of the Dutch and English habitation. We’ll observe evidence of the human occupation of the area, observe local geology and discover what the high tide line reveals. Meet at the parking lot at the end of Hylan Blvd. Greetings. 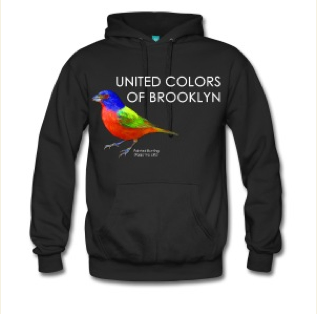 This is the New York Rare Bird Alert for Friday, November 23rd 2012 at 8pm. The highlights of today's tape are VIRGINIA'S WARBLER, CAVE SWALLOW, selasphorous hummingbird, BLACK-HEADED GULL, BARNACLE GOOSE, EURASIAN WIGEON and lots of crossbills. VIRGINIA'S WARBLER continues its very elusive presence at Alley Pond Park in Queens seen there every day this week through today but usually just for a short period as it works its way through a section of heavy brush and thickets. The bird has often first been detected by its chip note but patience is usually required before the bird comes into sight. It has been reported that the bird has been heard singing and it does appear to be an immature male but certain individuals have unfortunately been playing a tape of the song consistently there this perhaps the source of the vocalizations. For the area to concentrate on the closest parking is along 73rd Avenue near the south end of Cloverdale Boulevard or 228th Street. Walk into the park to a paved path and go west this path goes along the wooded brushy area the bird favors. The second paved path is just on the other side of this wooded stretch closer to the parking lot off the park on 76th Avenue. The gully the bird sometimes is seen in is a continuation of this wooded area and is best viewed from the inner path which also goes by a scrubby area known as Nutmeg Meadow to about its south side. This another location visited by the warbler named obscurely for a Connecticut Warbler that was seen there earlier this year. A couple of dirt paths [...] the area between the two paved paths which do join near the 73rd and Cloverdale entrance. Appearing at a few locations last weekend were some CAVE SWALLOWS. Last Saturday at Jones Beach West End about 4 or so were spotted in the large Tree Swallow flock around the West End 2 parking lot and out east 3 were at Camp Hero in Montauk but these numbers were minimal compared to the gathering on Staten Island starting last Saturday. At the Cemetery of the Resurrection off Hylan Boulevard across from the Mount Loretto Unique Area flocks would converge on a pond in the cemetery to drink and then disperse again. The flock size varied but count estimates as high as 65 plus were reported. Fewer were still present yesterday with one seen there today. A selasphorous hummingbird at the Conservatory Garden at the north end of Central Park during the week appears to be a RUFOUS HUMMINGBIRD. Another selasphorous was seen briefly at the Rose Garden in the Brooklyn Botanic Garden today. An interesting report from Randall's Island Wednesday involved 2 adult BLACK-HEADED GULLS flying towards the Bronx and a LESSER BLACK-BACKED GULL was also seen there. Crossbill numbers along the south shore of Long Island remain large with good numbers of both WHITE-WINGEDS and REDS. Jones Beach West End has consistently featured nice flocks of both. Fewer have also been seen at Heckscher State Park and Smith Point County Park in Shirley provided an estimated 200 WHITE-WINGEDS today with a few REDS. Some WHITE-WINGEDS were along Dune Road west of Shinnecock today while both species were out at Kirk Park on the east side of the town of Montauk today. Nice for Prospect Park were both WHITE-WINGED and RED CROSSBILLS and EVENING GROSBEAK and PINE SISKINS on Wednesday. A few COMMON REDPOLLS are in evidence yet with one at Jones Beach West End last Sunday along with a GREAT HORNED OWL. The EURASIAN WIGEONS were still at Massapequa Preserve yesterday on the pond just east of the end of Pittsburgh Avenue. Three EURASIAN WIGEONS were together on Mill Pond in Sayville last Sunday. A first year male joining 2 adult plumaged birds. A BARNACLE GOOSE continues to visit Marratooka Pond in Mattituck. The pond is best viewed from New Suffolk Avenue where a nearby farm field also hosted a GREATER WHITE-FRONTED GOOSE today. A LARK SPARROW was at Caumsett State Park last Saturday. Nine or more RAZORBILLS were off Montauk Point today and a RED-NECKED GREBE was back at Culloden Point in Montauk. 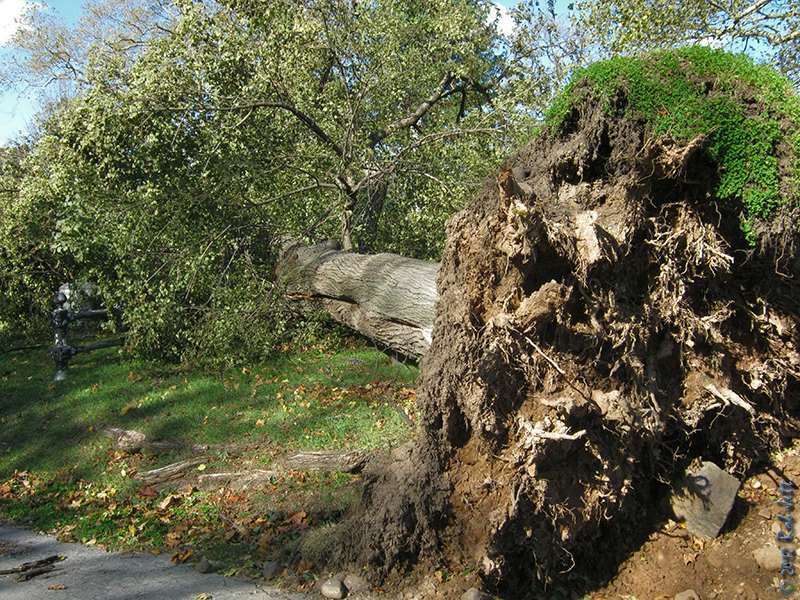 As the full extent of the devastation wreaked by superstorm Sandy sinks in, the question for the future is how to protect the New York metropolitan area when a similar disaster strikes again. Embryonic plans exist, both to erect massive flood barriers and for "soft" engineering schemes that would redesign waterfronts to incorporate wetlands, oyster beds and other natural features that could slow storm surges. The hope is that Sandy will provide the will – so far lacking– to turn these plans into reality. "It's not just a wake-up call, it's a wake-up scream," says Cynthia Rosenzweig of Columbia University. Years of work and tough decisions lie ahead. Flood defences don't come cheap and in a region with more than 2400 kilometres of coastline that is home to 20 million people, it isn't possible to protect everything. For instance, little can be done to shield the low-lying beachfronts on Long Island and Jersey Shore, which Sandy ravaged. There's also a philosophical gulf to be bridged between civil engineers, who want to hold back the waves with concrete and steel, and those who favour more natural solutions. One thing is clear: the threat is only going to get worse. Sandy's storm surge peaked at about 3.5 metres above average sea level in lower Manhattan. New York City officials currently assume that a 2.6-metre flood will happen once a century, and a 3.3-metre flood once every 500 years. The New York City Panel on Climate Change, co-chaired by Rosenzweig, has estimated that, by 2100, rising sea levels could bring 100-year floods every 25 years (Climatic Change, doi.org/fdq5g8). Factor in changes to storm patterns expected with climate change and they could strike every three to 20 years (Nature Climate Change, doi.org/jnm). Barriers with gates that can be closed when a surge is brewing are the obvious solution. It's a tried and tested technology, used extensively in the Netherlands to protect low-lying areas from North Sea storms. A team led by Malcolm Bowman of Stony Brook University's Storm Surge Research Group has studied the protection that could be offered by a system of three flood barriers (see map). To the south of Manhattan, these would be built across the Verrazano Narrows, between Brooklyn and Staten Island, and the Arthur Kill, between Staten Island and New Jersey. To the north-east, another barrier would block rising waters in Long Island Sound from surging down the East River. Simulations using a "juiced up" version of hurricane Floyd, which hit the region in 1999, indicate that the barriers would protect large areas from flood waters, says Brian Colle, a member of the Stony Brook team. Though Sandy's surge was much bigger, in principle barriers could be engineered to hold back such floods. The big problem with these barriers, however, is that they would leave densely populated areas – especially parts of Brooklyn and Queens – at the mercy of a storm surging into Jamaica Bay. In fact, those districts would be hit even harder if these barriers were built. 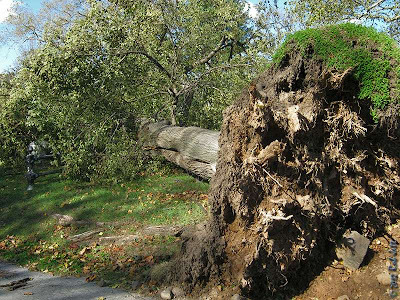 Philip Orton of the Stevens Institute of Technology in Hoboken, New Jersey, studied what would have happened if the three barriers were in place when tropical storm Irene hit in 2011. His simulations showed that they would have diverted the water, increasing flood levels by 5 per cent in Jamaica Bay. Any solution that protects Manhattan at the expense of poorer neighbourhoods is likely to be unacceptable – especially after the residents of Sandy-devastated Staten Island complained of being the "forgotten borough" as the city focused on restoring normality to Manhattan. So the preferred plan is to keep the northern barrier, and replace the two southern ones with a much larger, single barrier across the entrance to the New York-New Jersey harbour, with gates to allow ships through. Preliminary estimates from engineering firm Halcrow suggest that the outer barrier could be built for $5.9 billion – including bolstering the low-lying peninsulas of Rockaway and Sandy Hook to ensure that surges don't simply flow around it. The East River barrier could cost another $5 billion, says Bowman. Those are huge sums – but with losses from Sandy estimated at $50 billion it may be money well spent. Nevertheless, some experts warn against rushing into plans to build massive barriers, which would fundamentally change the region's environment. "We've learned in the past several decades that you harm fisheries if you block estuaries," says Orton. "You reduce the flushing. Therefore the amount of pollution in the system is going to grow." Such concerns explain the enthusiasm in some quarters for soft-engineering solutions, including the construction of new wetlands and oyster beds, which can help to slow storm surges. The region's architects have turned these ideas into conceptual designs. In 2009, a team led by Guy Nordenson of Princeton University completed a study called "On the Water: Palisade Bay", which envisaged adding an archipelago of islands and reefs to the region, plus an extended waterfront including tidal marshes, piers and parks. Five teams of architects, engineers and landscape designers then refined the plans, which were exhibited in 2010 at New York's Museum of Modern Art. Lower Manhattan, for instance, would fringe its familiar skyscrapers with salt marsh, and extend the island's southern tip into a field of rectangular islands. Streets would get porous surfaces and some would be equipped with subterranean channels that would drain storm surge water back out to sea. The designs are stunning but do not come with cost estimates or storm-surge modelling to show what they might achieve. "I see them as dream exercises," says Benjamin Orlove of Columbia University, who studies environmental decision-making. While wetlands can obstruct a storm surge, much depends on the local geography and the nature of the storm. A common rule of thumb is that a wetland extending 14.5 kilometres out to sea will reduce the height of a storm surge by a metre. But if a storm moves slowly and winds drive at the coast for an extended period of time, these benefits can vanish. None of the experts contacted by New Scientist believes the architects' plans would protect against a major storm. "Big events require big engineering. I don't see any other way," says John Mutter of Columbia University, who studies vulnerability to natural disasters. Still, artificial wetlands and other soft engineering approaches could improve resilience against smaller storms, and be part of a comprehensive approach to flood protection. "We need to look to the Dutch," says Rosenzweig. "They have the barriers, but they realise that hard engineering is not going to save them completely." For instance, in the Netherlands, agricultural land is used to soak up excess water in floods. Political leaders seem divided on how to proceed. While New York state governor Andrew Cuomo has said that officials need to approach flood protection with an open mind in the light of Sandy's devastation, New York City mayor Michael Bloomberg remains sceptical about flood barriers. Sunday, November 25, 2012, 10 a.m. Prospect Park "Friends Holiday Walk"
Sundays, September 2-November 25, 10-11am Guides: NYC Audubon Offered by the Central Park Conservancy Meet at the Dana Discovery Center (inside the Park at 110th Street between Lenox and Fifth Avenues). 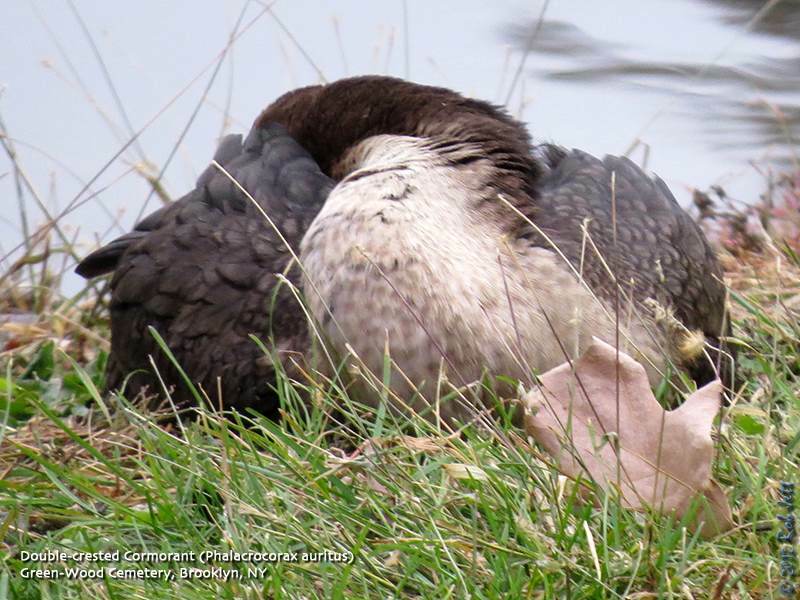 Bring the kids and visit one of New York City’s richest bird habitats. Learn as a family how to spot and identify our feathered neighbors in their natural surroundings. Binoculars can be borrowed from the Visitor Center. For weather cancellation information, call 212-860-1370. Limited to 20. Age 5 and up. Join naturalist Mike Shanley as he explores Great Kills Park. Many birds make their home here during the winter including Snowy Owl, Horned Lark, Snow Bunting and Lapland Longspur. Bring binoculars and sturdy shoes/boots. Meet at the second parking area, across the park road from the ranger station. Look, up in the sky, it’s a bird! But what kind? Take a tour and learn about the magnificent array of birds that call Prospect Park home. Greetings. 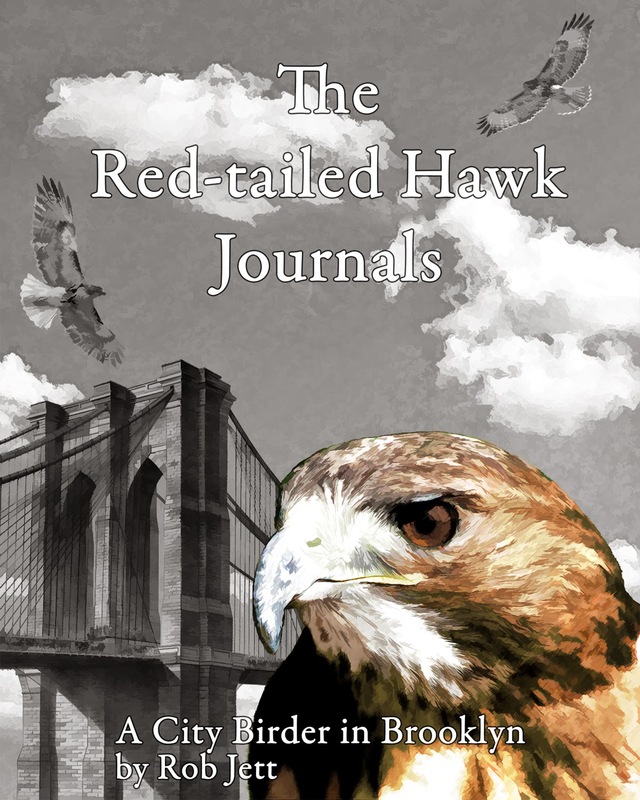 This is the New York Rare Bird Alert for Friday, November 16th 2012 at 7pm. The highlights of today's tape are VIRGINIA'S WARBLER, NORTHERN LAPWING, BREWER'S BLACKBIRD, SCISSOR-TAILED FLYCATCHER, PAINTED BUNTING, WESTERN KINGBIRD, GREATER WHITE-FRONTED GOOSE, BARNACLE GOOSE, EURASIAN WIGEON, HARLEQUIN DUCK, NORTHERN SHRIKE, lots of winter finches and even unidentified selasphorous hummingbird and myiarchus flycatcher. Wow! A spectacular week locally topped by the eventually more findable VIRGINIA'S WARBLER at Alley Pond Park in Queens. Last Saturday the warbler was spotted in a stretch of woods on the west side of the park where this elusive bird has more frequently been seen though missed on Tuesday and Thursday. It has remained very skulky and is usually only visible for a minute or two. From the initial sighting on October 31st the bird has only been seen once on November 5th until last Saturday and was in that same area today. For this area, to concentrate on, closest parking is along 73rd Avenue at the Cloverdale Boulevard intersection. Cloverdale would also be 227th Street. Go up the path into the park to a paved path on the other side of the path is a wooded scrubby area and the warbler has been working this stretch east and west along the path. The area can also be viewed from a parallel path on the other side of the scrubby area. Park parking is also available off 76th Avenue. It should be a first New York State record once accepted by NYSARC. Also at Alley Pond Park has been NORTHERN SAW-WHET OWL, ORANGE-CROWNED WARBLER, WHITE-WINGED CROSSBILL and COMMON REDPOLL among others. Out at the Montauk area two NORTHERN LAPWINGS were discovered Saturday at the Deep Hollow Ranch complex along Route 27 east of the town of Montauk. The lapwings had been seen daily to Wednesday but not reported Thursday or today. At times they were on pastures on the south side of Route 27 but also ranged north to the pastures that were viewable from the Theodore Roosevelt County Park along the west side of Deep Hollow Ranch. For these park at Roosevelt and walk north along the white trail using various vantage points to view the pastures. On the south side on Sunday were also a CACKLING GOOSE and an apparent "Dusky" CANADA GOOSE. Also on Montauk on Sunday a female BREWER'S BLACKBIRD was present around the pond at Rita's Horse Farm. This farm is between Montauk Town and Deep Hollow Ranch on the north side of Route 27. This is an operating stable so do not park there when so requested or there is commercial activity going on. The pond can be viewed from the side of Route 27 but make sure to park off the road. A WHITE-RUMPED SANDPIPER was also there Sunday. A myiarchus flycatcher possibly ASH-THROATED FLYCATCHER was at Rita's on Saturday but could not be relocated. In the town of Montauk at the west end is small Kirk Park, a parking lot surrounded by pines, where a flock of 25 plus WHITE-WINGED CROSSBILLS spent much of last Sunday with a few lingering into the week. Another NORTHERN LAPWING was photographed on November 8th in the median at the now closed Robert Moses State Park. By Saturday an adult male PAINTED BUNTING was photographed at a private feeder in Port Jefferson and on Sunday afternoon a SCISSOR-TAILED FLYCATCHER was photographed near parking field 3 at Sunken Meadow State Park but could not subsequently be relocated. In Manhattan single selasphorous hummingbirds were seen last Sunday at the Heather Gardens at Fort Tryon and then on Tuesday at the Conservatory Garden at the north end of Central Park and a BARNACLE GOOSE was present with Canadas on the ballfields at Inwood Hill Park Sunday to Tuesday. A NORTHERN SHRIKE spotted on Long Island's north shore at Caumsett State Park last Saturday was still present Thursday when a WESTERN KINGBIRD was also found there. A EURASIAN WIGEON was still at Massapequa Preserve on the first pond north of Clark Boulevard on Monday and another was still on Mill Pond off Montauk Highway in Sayville on Thursday. 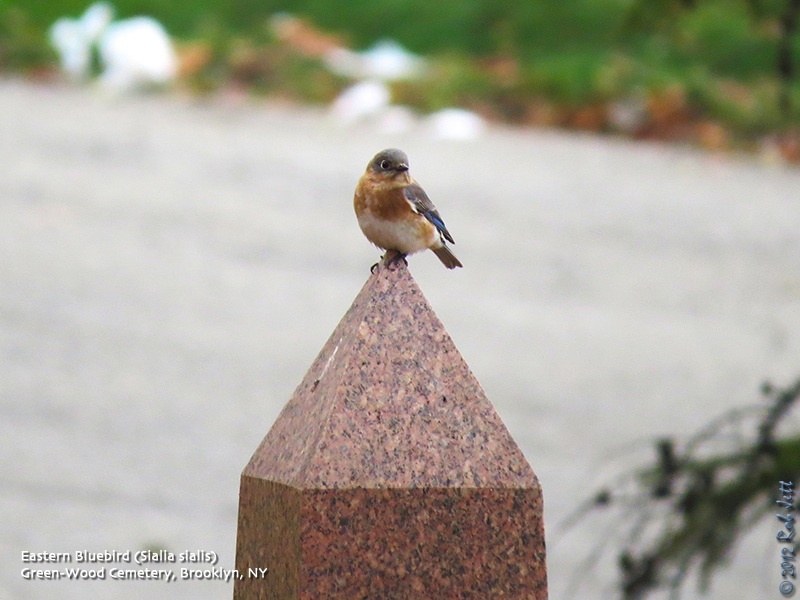 A particularly nice flight going on, one RED CROSSBILL and 25 WHITE-WINGED CROSSBILLS were in Green-wood Cemetery in Brooklyn on Saturday. White-wingeds have been widespread with a few REDS and EVENING GROSBEAKS and COMMON REDPOLLS also appearing. GRASSHOPPER and CLAY-COLORED SPARROWS were at Kissena Corridor Park in Queens Monday. A BARNACLE GOOSE was reported from Marratooka Lake in Mattituck early this week and 2 female HARLEQUIN DUCKS were at Lazy Point inlet at Napeague Wednesday. Five GREATER WHITE-FRONTED GEESE were with Canadas on the north side of Further Lane in East Hampton last Sunday and a SHORT-EARED OWL flew over Route 111 in Eastport Sunday evening. 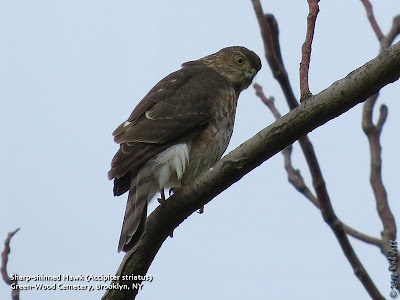 The Sharp-shinned Hawk is a small raptor that frequently overwinters in our city parks. No larger than a Blue Jay, these predators have learned that birdfeeders are like fastfood restaurant drive-up windows; an easy place to pick up a quick meal of songbird. This individual above Green-Wood Cemetery's Dell Water wasn't fast enough and all the birds vanished into the underbrush in the blink of an eye. The New York Times just published a very interesting article on the ability of birds to survive storms. 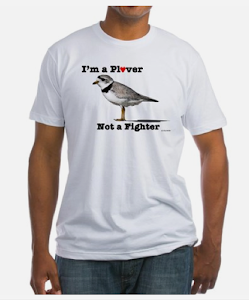 As I'd mentioned in a previous posting, biologist Ron Pittaway has forecast that this winter we'll be seeing various species of "winter finches" moving into our area. The species not typically seen around New York City, or at least not seen in abundance, that we should expect to see in our parks and at our backyard feeders are - Pine Grosbeak, Purple Finch, Red Crossbill, White-winged Crossbill, Common Redpoll, Pine Siskin and Evening Grosbeak. The siskins have already arrived and I've been observing them in good numbers nearly everywhere I go. I even had a flock fly over Robin and I while we relaxed on the roof last month. 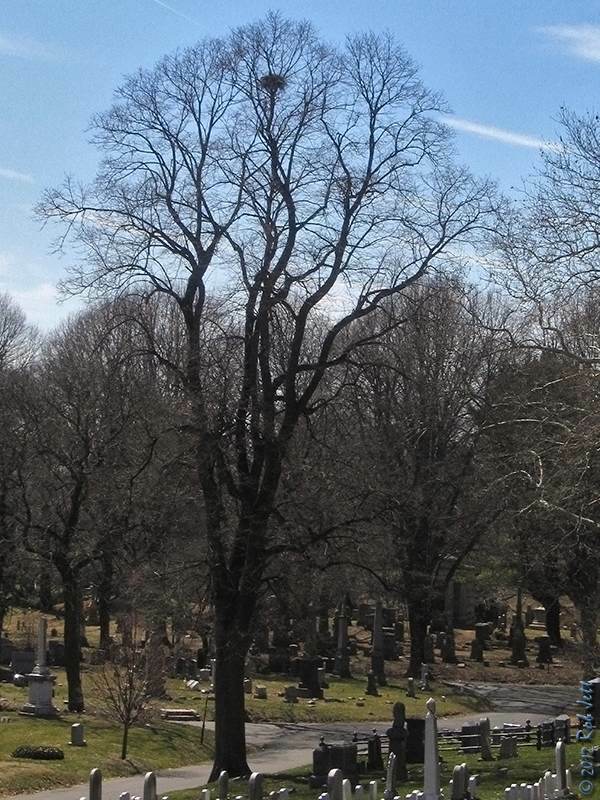 The crossbills feed on pinecone seeds, so I've been concentrating my efforts at Green-Wood Cemetery, where there are many mature, cone-laden conifers. This past Saturday I spent 6 hours wandering Green-Wood and the effort eventually paid off. The highest concentration of conifers is in an area called "The Flats", which is below the ridges of the terminal moraine and runs parallel to Fort Hamilton Parkway. I decided to first walk up Ocean Hill, where there are also a good number of pines, before heading down to The Flats. 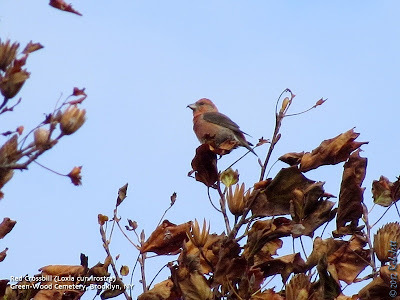 At around 8:45am I had just ducked under the low branches of a yew tree to scan for owls when we heard the dry chirps of an incoming flock of White-winged Crossbills. It took Heydi and I a moment to locate the flock but eventually spotted a flock of about 25 White-winged Crossbills in a pine tree next to Stephen Whitney's copper-roofed chapel. The flock eventually took off towards the "Catacombs". We tried to follow the fast moving flock in an attempt to take some photos. A short time later we saw the chattering flock flying near the Crescent Water. We ultimately realized that chasing after a single flock of crossbills was an exercise in futility, so returned to our game plan which was to walk The Flats, scanning the abundant conifers in that area. At around 10:15am we heard a calling Red Crossbill, then spotting a single bird as it flew over us near the "Valentine" angel on Cypress Avenue. At around 11:30am we heard a loud "jip, jip, jip, jip, jip" call coming from the top of a towering tulip tree. The bird was a long distance off and neither of us were certain, at first, what it was. Moving a little closer, we were elated to find that it was a Red Crossbill. It was more than a little ironic that we had been focusing our search exclusively on evergreens only to finally find this winter finch in a deciduous tree. The bird was very cooperative and remained long enough that we were able to take a few photos. It then flew a short distance to a spruce tree where it continued to call for a few minutes. It only stopped very briefly to feed on the tree's cones. During the excitement I managed to send out a text alert to the local birders. Tom Stephenson was the first to respond and said he would be there shortly. In the meantime, the bird decided to fly off in the direction of the Catacombs and Ocean Hill. By the time Tom arrived the bird was gone, so we headed up Grape Avenue in an attempt to track down both crossbill species for him. Near Cedar Dell we ran into Cindy Cage, who had also responded to my text alert. The four of us spent several hours zig-zagging our way through the cemetery in the hopes of stumbling on these wandering northern birds. We scoured The Flats, the ridge above William Niblo, Steep-side Path and the ridge at Horace Greeley, but the crossbills eluded us. A consolation prize for the effort, however, was finding a pair of Eastern Bluebirds next to Horace Greeley. As we descended Steep-side Path and approached the Sylvan Water, I noticed something odd along the shore on the West side of the lake. It appeared to be a lump of dark brown feathers. It seemed too small to be a Canada Goose and it wasn't moving. I wasn't sure if it was a sleeping or deceased bird. It was definitely a bird, but I couldn't see its head. As we got closer I realized that it was a Double-crested Cormorant. The pale throat and breast indicated that it was a juvenile bird and, by its behavior, something was wrong with it. They are seldom found far from the water and this individual was a few feet up on the shore. I approached the bird slowly to see if there was an obvious injury. It remained lying down and allowed me to walk right up to it. Backing off, I called Bobby Horvath to see if he could come by for the rescue. Bobby had his hands full rescuing oiled waterfowl in the Rockaways and recommended Sean Casey, a local wildlife rescuer. Sean was great. He arrived very quickly with an assistant and was able to capture the cormorant. The poor bird had a fishing hook impaling his left foot. The foot appeared swollen and I assume was infected. Cormorants are diving birds that rely on underwater speed to catch fish. This bird was likely unable to feed very well and, in addition to the infection, was probably malnourished. 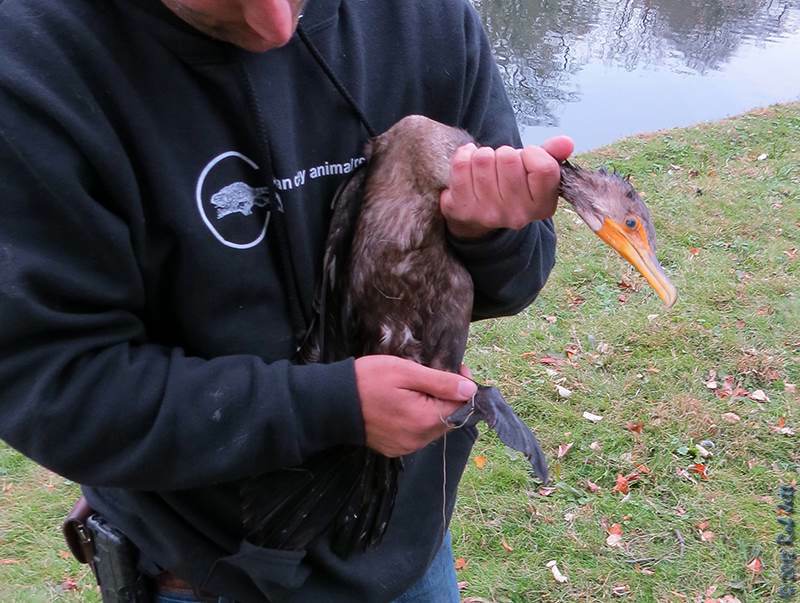 Thankfully, this bird now has a good chance of recovery and release back into the wild. I'll post an update as soon as I know anything. Gizmodo reports on a new battery technology breakthrough that will help renewable power sources. A new battery technology may pave the way for cheap, long-lived power storage that can quickly pump electricity into the grid to compensate for fluctuating renewables like wind and solar. Developed by Yi Cui and colleagues at Stanford University in California, the battery's key advantage is its electrodes, which can run for a thousand charge cycles without degrading. Battery electrodes typically degrade over time as ions in a battery cell repeatedly slam into them and are ripped away again. By coating the negatively charged cathode in copper hexacyanoferrate and using an anode made of activated carbon and a conductive polymer - compounds that allow electricity-carrying ions to move easily in and out - the team were able to build a prototype battery with electrodes that didn't lose capacity over time. The new electrodes sandwich a liquid solution of positively charged potassium ions, a battery design that was invented only in 2004 using conventional electrodes. As in a standard battery, charged particles are driven towards the positive electrode during charging, flowing back to the negative electrode to provide current during discharge. The researchers write that their battery's components are cheap and commercially available. Most energy-storage technologies are too expensive or inefficient to be widely useful in backing up wind and solar power sources, the researchers say. "Virtually all of the energy-storage capacity currently on the grid is provided by pumped hydroelectric power, which requires an immense capital investment, is location-dependent and suffers from low energy efficiency," the team write. Sunday, November 18, 2012, 10 a.m. Walk the now-desolate beach at Riis Park with Mickey Maxwell Cohen, American Littoral Society naturalist. Check the flotsam on this stormy beach while learning about the aeronautical and military history of the area. Meet at the bathouse entry pavilion. Call Mickey for info: 212-510-8880; email: bmcohen2@gmail.com. WITH GATEWAY NATIONAL RECREATION AREA. Saturday, November 17, 2012, 10:00 a.m. to 2:00 p.m.
Meet in Nevada Avenue parking lot of High Rock Park. We will try to cut Viburnum Leaf Beetle eggs from Arrowwood Viburnums. After a two hour work session (our 196 consecutive workshop), we will take a short hike over nearby trails. Greetings. 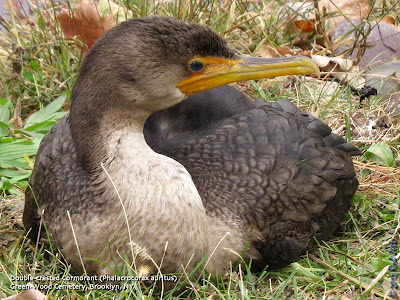 This is the New York Rare Bird Alert for Friday, November 9th, at 7:00pm. Sorry for last week's weather-related nonrecording. The highlights of today's tape are VIRGINIA'S WARBLER, CAVE SWALLOW, BLACK-HEADED GULL, WESTERN KINGBIRD, BLUE GROSBEAK, and arriving winter finches. A bird tentatively identified by its finder as VIRGINIA'S WARBLER at Alley Pond Park in Queens on Wednesday, October 31st, and glimpsed by one of two observers at Alley on Monday, was found again today and photographed at Alley Pond Park, the photos showing all the field marks one would want to confirm the identity as a VIRGINIA'S WARBLER and rule out an extremely dull Nashville. Unfortunately, this bird is very elusive, having been looked for extensively last week and this, but only spotted three times. Twice it has initially been detected by its soft chipnote, and today it was photographed feeding on the ground. It has been frequenting the wooded area west of the baseball and cricket fields near the parking lot off Winchester Boulevard, though the appropriate area may be closer to the parking area off 76th Avenue on the west side of the park. Today the bird was seen off the path that goes west from left field on the baseball diamond, past some obstacle course equipment, up near a small weather station in the woods and some green shipping containers, but the bird obviously moves around quickly and can get lost easily. Other recent rarities include a CAVE SWALLOW, seen at the Dyker Beach ball fields in Brooklyn last Sunday; a WESTERN KINGBIRD photographed flying up Third Avenue in Manhattan Monday afternoon; and an immature BLACK-HEADED GULL out east at Hook Pond off Dunemere Lane in East Hampton on Thursday. Certainly exciting recently has been the variety of winter finches coming into our area. WHITE-WINGED CROSSBILLS have been fairly widespread since last Sunday, the sightings including 30 in Green-Wood Cemetery in Brooklyn, and 9 in a Queens backyard on Sunday, and about a dozen near Shakespeare Garden in Central Park Tuesday, with a couple there the next day. Outside the city were some in Rye Sunday to Tuesday, 10 in Setauket, 5 in Patchogue, and 6 in Sayville Sunday morning, and other reports as well. Fewer EVENING GROSBEAKS were also noted, with 13 passing over a patient birder in a Queens gas line Saturday, 2 in Central Park Sunday and Monday, and a few other observations, including 10 in East Patchogue Sunday. In addition to these, 2 COMMON REDPOLLS were spotted in Setauket Tuesday, and of course numbers of PINE SISKINS and some PURPLE FINCHES remain in the area. Also locally, in Central Park both BARRED OWL and NORTHERN SAW-WHET OWL appeared recently, but both were harassed from their roosting sites. A VESPER SPARROW was at Randall's Island Saturday, and a BLUE GROSBEAK continued at least to Thursday along with a decent gathering of landbirds at Kissena Park in Queens, these other birds including ORANGE-CROWNED WARBLER and VESPER SPARROW. A GRASSHOPPER SPARROW was in Prospect Park Saturday to Monday, and a LAPLAND LONGSPUR and NELSON'S SPARROW were among the birds at Brooklyn's Calvert Vaux Park last Saturday. Out east, two CATTLE EGRETS were in a Sagaponack field on Wednesday, on the south side of Daniel's Lane, and a GRASSHOPPER SPARROW was at Montauk Point today. This juvenile Red-tailed Hawk perched at the edge of Green-Wood Cemetery's Dell Water spent much of her morning relentlessly pursuing a Mallard breakfast. The four ducks in the water below seemed unconcerned with the young hawk's frequent, imprecise strikes. She eventually gave up. I can't say if this is one of Big Mama and Junior's offspring or if it is one of the dozens seen migrating through the area that decided to stop off to rest and eat. 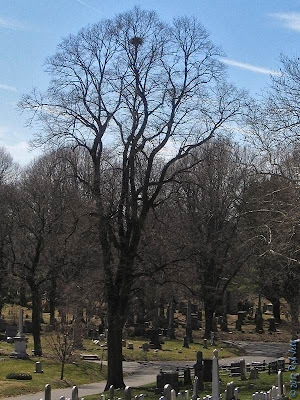 "Big Mama" and "Junior", Green-Wood Cemetery's resident Red-tailed Hawk pair have lost their favorite nest tree. 1. New York Cares is driving a number of Hurricane Sandy relief projects, from composting with Build It Green! in Queens to a Clean-Up at Franz Sigel Park in The Bronx. 2. The NYC Mayor's Office is urging people to sign up through NYC Service. They are seeking volunteers for various efforts (via Gothamist). 3. Staten Island Recovers is coordinating "community-powered disaster recover" for Staten Island. They are accepting donations of clothing, tools, and any other helpful items you may have (via Time Out NY). 4. New York Tech Meetup is looking for tech all-stars to lend their skills and help small businesses get their websites back up and running (via Time Out NY). 5. NYC.gov lists Public Emergency Shelters for Hurricane Sandy, which need volunteers and donations. If you are close by, or can get there safely, you can inquire directly to see what help and supplies is needed (via Support Victims of Hurricane Sandy on Facebook). 6. Food Not Bombs is seeking volunteers and donations for its Northeast chapters in NYC, Boston and Philadelphia (via via Time Out NY). 7. Congregation Beth Elohim in Park Slope needs volunteers to help today and tomorrow preparing food and making deliveries. You can sign up for a shift, here. They are also accepting donations of candles, batteries, flashlights, water, non-perishables, and more for shelters in Red Hook. 8. The Salvation Army is aiding those in crisis with hot meals, water, and shelter. To send a $10 donation via text message, you can text the word STORM to 80888, and confirm the donation with the word, “Yes.” They are also accepting used clothing and furniture donations to local Salvation Army locations (via NBC News). 9. The Food Bank For New York City is distributing emergency food and supplies. To donate, text FBNYC to 50555 or make a monetary contribution online. Their local food pantries and kitchens also need disaster response volunteers--sign up, here (via Gothamist). 10. The Humane Society is leading pet search and rescue efforts. To support their initiatives, click here. 11. The Brooklyn Recovery Fund is aiding local Brooklyn nonprofits, civic institutions, and small businesses impacted by Hurricane Sandy (via Support Victims of Hurricane Sandy on Facebook). 12. The American Red Cross is offering shelter, clothing, supplies, food and blood to Hurricane Sandy victims. To donate $10 to the American Red Cross Disaster Relief, text the word REDCROSS to 90999 or you can call 800-RED-CROSS (1-800-733-2767). To donate blood, visit the Red Cross website (via NBC News). NYC.gov lists food and water distribution locations and times in Brooklyn, Staten Island, Queens, and Manhattan. Sunday, November 11, 2012, 10 a.m.
Guide: Gabriel Willow With Wave Hill Meet at the Perkins Visitor Center. Naturalist Gabriel Willow contributes his extensive knowledge of bird species and their behaviors on these captivating walks. Wave Hill’s garden setting overlooking the Hudson River flyway provides the perfect habitat for resident and migrating birds. Ages 10 and up welcome with an adult. Reservations recommended; register online at www.wavehill.org, by calling 718-549-3200 x305, or at the Perkins Visitor Center. Severe weather cancels; for updates call 718-549-3200 x245 by 8am the day of the walk. NYC Audubon members enjoy two-for-one admission. Saturday, November 10, 2012, 12 noon to 2:00 p.m.
We’ll follow the multi-use trail overlooking Fresh Kills, pass the famous Hessian Spring as it crosses the path and view Fresh Kills estuary and work our way to the remains of Ketchum’s Mill. We’ll observe traces of the past, examine the present woodland ecosystems and search for evidence of deer. Meet in the lot alongside St. Andrew’s Church on Old Mill Road. Sunday, November 11, 11 a.m. to 3:30 p.m. Enjoy a brisk 6-mile roundtrip walk on the white trail in Willowbrook Park to the Nature Center, where we’ll stop for lunch and nature study. Drivers: use the entrance off Richmond Avenue and Eton Place and follow the road to the parking lot at the archery range where we’ll meet. We go in all weather. Please bring snacks and beverage and wear comfortable clothes and shoes. For more information, contact Hillel Lofaso at 718-477-0545. The annual Bill Flamm Walk out to Crooke’s Point in search of the migrant bird-life that long-time bird watcher Bill so enjoyed. Meet in last parking area before Crooke’s Point. 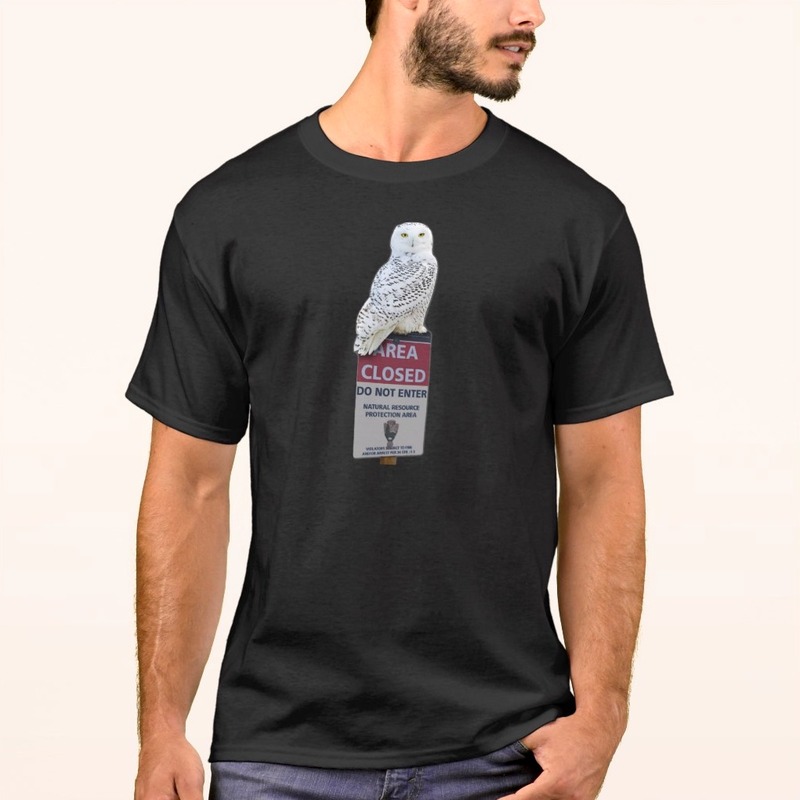 Check for migrants and talk birding with John Young. Bring your own binoculars, if you have them.